Mr John Angell-James gave his Semon Lecture in 1965. He discussed the advances in knowledge of the pituitary since the lectures given in 1940 and 1961 and notes that it is less of a focus now in otolaryngology. He then reviews the part that otolaryngology plays in the clinical and laboratory problems of the pituitary and then goes on to discuss various pathologies and treatments, with a focus on surgical removal and outcomes. John Angell-James was born on the 23rd of August 1901 in Bristol, England. 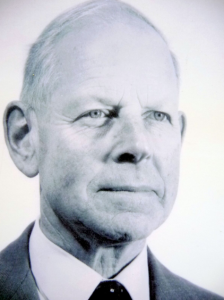 He was responsible for pioneering two major operations, one of which was transethmoidal hypophysectomy through the nose and the other was to cure Meniere’s disease using ultrasound to selectively destroy certain semicircular canals. Impressively, he managed to balance his busy surgical career with his role as a farmer and in fact won the silver medal at the International Dairy Event at Stoneleigh Park in 1974.